What is the FURminator Nail Grinder Replacement Grinding Bands 6 pk? 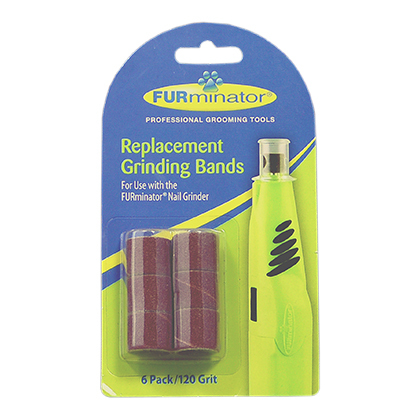 The FURminator Nail Grinder Replacement Grinding Bands 6 pk is a pack of six 120-grit sandpaper bands for use with the FURminator Nail Grinder (sold separately). Replacing worn grinding bands will help you trim your pet's nails faster and will give nails a smooth finish. They are easy to replace using a Phillips screwdriver (not included). NOTE: FURminator Replacement Grinding Bands are for use with the FURminator Nail Grinder only (sold separately). FURminator Replacement Grinding Bands are made for the FURminator Nail Grinder. The 120-grit sanding surface helps to shape nails quickly and leaves a smooth finish. Each pack contains 6 replacement grinding bands. As with all pet nail grooming tools, care must be taken not to damage the quick of the nail, which is the pink area that contains the blood vessels and nerves. Use as directed. Keep out of the reach of children. Make sure the FURminator Nail Grinder is off and remove the batteries prior to opening the clear protective cover. Gently pull the clear protective cover off. Holding the Grinding Band between your fingers firmly, loosen the single screw on top of the Grinding Band by turning the screw counter-clockwise with a Phillips head screwdriver. Remove the old Grinding Band and replace with a new one. Insert and tighten the screw on top of the Grinding Band. Do not over-tighten. Place the clear protective cover back on and reinsert the batteries. Replace the Grinding Band when it appears worn or when it becomes more difficult to file your pet's nails. Six (6) 120-grit Replacement Grinding Bands for use with theFURminator Nail Grinder.